Catastrophic plate tectonics seems to be sped-up plate tectonics, a paradigm assumed too quickly and with many uniformitarian assumptions, including ‘precise’ radiometric and fossil dates. New geophysical data sets on subduction zones are contrary to plate tectonic expectations and indicate that subduction is unlikely. Without subduction, plate tectonics and catastrophic plate tectonics is impossible, unless the Earth expands. A cursory description of some of the many other problems associated with plate tectonics is provided. These problems should generally apply to catastrophic plate tectonics. A few unique problems are associated with catastrophic plate tectonics, such as excess heat caused by sliding plates and lava resurfacing, Wilson cycles, and copious post-Flood catastrophism as the ocean-bottom lava cools over a few hundred years. Although I do not need to provide an alternative mechanism in this forum, I lean toward the hypothesis of vertical tectonics, possibly combined with meteorite impacts. The catastrophic plate tectonics model of Austin et al. is a sophisticated Flood model that deserves much attention. 1I am impressed with all the hard computer modeling work by John Baumgardner. I commend the authors involved in this model for all their effort. However, I have a number of problems with the model. In this initial presentation of a catastrophic plate tectonics forum, I will state the philosophical problem of borrowing so many uniformitarian deductions from plate tectonics. Then I will briefly mention evidence from new geophysical data sets that subduction is unlikely. This information in more detail has been published elsewhere.2,3 Without subduction, plate tectonics is impossible unless the Earth expands. I will give a very cursory description of some of the many other problems associated with plate tectonics, which should generally apply to catastrophic plate tectonics. A few unique problems with catastrophic plate tectonics will be brought to the attention of the readers. It is preferable to be able to provide an alternative model, which is briefly introduced in the final section. One of the main philosophical problems with plate tectonics is that in the 1960s scientists accepted plate tectonics too quickly with little critical thought. Those who accepted plate tectonics the earliest were the least familiar with the literature, while later advocates believed plate tectonics more by faith.11 Plate tectonics was little accepted by scientists until the magnetic anomalies in the ocean crust were discovered in the 1960s.12 (I may add that it was the very symmetrical Eltanin-19 anomaly profile, bolstered by ‘precise dates’, that was very instrumental in persuading many to believe in plate tectonics. Other anomaly profiles are not as good.13) Consequently, there was a wholesale and rapid conversion—a bandwagon effect—to belief in plate tectonics. Because of such uncritical acceptance of plate tectonics, creationists should thoroughly examine the paradigm before using it. She says that plate tectonics advocates just look at faunal lists and then match continents,16 and that much of plate tectonics is story telling.17 With all these problems within plate tectonics, how can the advocates of catastrophic plate tectonics justify the incorporation of the paradigm into a Flood model? In view of the quick acceptance of the plate tectonics paradigm, and the practice of fitting almost any observation into it, I have critically analyzed geological observations of subduction zones.2,3,18 Trenches were envisioned as linear belts of thick sediment accumulated during millions of years of convergence. However, many trench segments are either empty or nearly empty of sediments! The remainder of trenches have moderately thick and horizontally layered sediments, indicating a lack of convergence during the time of filling. The trenches were presumed to have been filled with pelagic and hemipelagic sediments from the ocean plate, but instead are filled by turbidites from the land. These anomalous features of trenches are explained by several ad hoc mechanisms that seem far fetched. large areas of the continental margin have supposedly been subducted. Despite the secondary hypothesis of sediment subduction, one can legitimately ask whether landward and arcward slopes show compelling evidence for plate tectonics at all. The earthquakes that define the Wadati-Benioff zone are pointed to as proof that one plate is sliding below an upper plate. However, there are many complications with this simple interpretation. The Wadati-Benioff zone comes in many patterns that change along strike. It can even be regionally horizontal, as in the Peru-Chile subduction zone. Seismic gaps commonly occur in the Wadati-Benioff zone near the trench and at intermediate depths, which seems anomalous, especially at shallow depths where the frictional force should be substantial. Wadati-Benioff zones can be vertical, like the Mariana subduction zone. Most interesting is that at intermediate levels the underthrust shearing of one plate past another does not seem to occur; it is more the opposite with a tendency for tension. And most anomalous is that the direction of earthquake fault motion is usually not in the plane of the Wadati-Benioff zone but at an oblique angle to it. Furthermore, some deep quakes occur relatively distant from the Wadati-Benioff zone. Double seismic planes are a further complication. There is still a theoretical problem understanding how deep quakes can occur at all when the mantle should be ductile below about 100 km. All these complications point to another mechanism. Vertical tectonics in which the island arc represents upwelling of hot mantle, while the trench and Wadati-Benioff zone represent a response to this upwelling, seems to fit most of the observations, including heat flow data and gravity anomalies. The explanation of mountain building is supposed to be one of the great achievements of plate tectonics. However, a close look reveals many serious problems. First, it is difficult to relate all mountains, volcanoes and deep basins in intracontinental areas to ancient plate tectonics. Secondly, the melting and bubbling up of magma from the subduction zone starting about 100 km deep has troublesome scientific problems, such as how does the liquid gather together and make room for itself? The great chain of the Andes Mountains was supposedly made in this way, but the plate tectonics model is hard pressed to explain this. Newer data show that subduction is unlikely to have occurred in the past. This makes plate tectonics, as well as catastrophic plate tectonics, impossible unless the Earth expands. One main problem with plate tectonics is that geophysicists have difficulty providing a mechanism for it.22 Advocates should not be faulted for this lack, because such a mechanism would be difficult to establish. There are mainly three candidates for a mechanism: 1) horizontal rafting of plates on mantle convection cells, 2) ridge push, and 3) slab pull in subduction zones. Model builders now favor slab pull, where the gravitational potential energy during subduction provides a suction force to drive the plate. However, the potency of slab pull is questionable. Hence the driving mechanism for plate tectonics is still unsolved, and the models of plate motion include many assumptions and simplifications that may be unrealistic.23 VanDecar, James and Assumpςao24 believe that slab pull and ridge push appear inadequate to drive large plates. Anfiloff and Hast have a good suggestion. Thus, the ‘fit’ could have been caused by differential vertical tectonics in a common stress field that occurred in one world-wide event, namely the Genesis Flood. In regard to paleomagnetism, it is interesting how scientists can come up with so many impressive ‘data’ in support of plate tectonics. I attribute this to the reinforcement syndrome, whereby a hypothesis is repeatedly reinforced by further ‘data’.32 Furthermore, I believe that many of the ‘proofs’ of plate tectonics look impressive at first glance because of the reinforcement syndrome. Many people have seen pictures of a mid-ocean ridge, which is commonly offset 90° to the ridge axis. These offsets are called ‘transform faults.’ These faults continue away from the ridge as long fracture zones that can continue across the ocean basins for thousands of kilometers. The mid-Atlantic ridge is especially intriguing because it lies midway between the continents and makes the sea floor spreading scenario appear reasonable. There is now a wealth of complications in interpreting mid-ocean ridges and their 90° offsets by fractures as due to sea floor spreading.33 There are also other mechanisms that can cause such a ridge-fracture pattern. A special problem is why segments of mid-ocean ridges should end abruptly and begin again up to several hundred kilometers away at a 90° angle.34 How can such a sharp pattern represent the surface expression of upwelling mantle convection? On the other hand, an experiment in pulling apart freezing wax resulted in a similar pattern as the mid-ocean ridges with their orthogonal fractures.35,36 Hast believes that indeed the pattern of the mid-Atlantic ridge and east-west fractures represent an orthogonal fracture system.26 The pattern of mid-ocean ridges and their 900 fractures could simply be the expression of differential vertical tectonics between the ridge and adjacent abyssal plains. There are several large-scale features on the ocean bottom that indicate little plate movement.40 For instance, the huge Zodiac terrigenous fan lies south of the western Aleutian Islands in the Gulf of Alaska and extends down to about 44°N at 160°W. It is estimated to cover an area greater than 1,000,000 km2 with a volume of 280,000 km3. The northern proximal part of the fan lies on the southern lip of the Aleutian trench. The material came from the north in western Alaska across the eastern Aleutian Trench. The fan is considered of early Cenozoic age, indicating that the Aleutian Trench is a relatively recent feature within the uniformitarian time scale. Since the fan is on the Pacific plate, and the Pacific plate has been moving generally northwest, this fan would have been well out in the Pacific Ocean, 1,500–3,000 km from the nearest continental landmass, in the early Cenozoic.41 If it was well out into the ocean, where did the fan collect all its terrigenous sediment, assuming plate tectonics is true? The above are only some of the major problems with plate tectonics. There are many more, such as Africa and Antarctica surrounded by spreading ridges with no compensating subduction zones.42 In fact, the African plate is well known for extensional features, such as the Eastern African rift, which is the opposite to that expected. Although catastrophic plate tectonics may ‘solve’ a few of the problems of plate tectonics, such as providing a possible mechanism, it creates new problems. One of these problems is the high heat generated by rapid plate sliding. Another problem is how do advocates handle all the claimed pre-Mesozoic plate motions, such as Wilson cycles,43 suggested by mainstream scientists? Advocates of catastrophic plate tectonics will likely challenge me to provide an alternative mechanism. Although philosophically I have no need to provide an alternative, nevertheless I have an hypothesis to offer. It is the mechanism of vertical tectonics with a little horizontal motion, alluded to in the sections above. (At this moment in time, I lean towards meteorite impacts to start and/or sustain the Flood.) Evidence for vertical tectonics is ubiquitous on the continents. For instance, most of the mountain ranges of the world have marine fossils. Mount Everest is capped by limestone that contains marine crinoid fossils. This represents at least 9 km of vertical uplift, sea level fall, or both. Austin, S.A., Baumgardner, J.R., Humphreys, D.R., Snelling, A.A., Vardiman, L. and Wise, K.P., Catastrophic plate tectonics: a global Flood model of Earth history; in: Walsh, R.E. (Ed. ), Proceedings of the Third International Conference on Creationism, Technical Symposium Sessions, Creation Science Fellowship, Pittsburgh, pp. 609—621, 1994. Return to text. Oard, M.J., Lack of evidence for subduction renders plate tectonics unlikely: Part I—Trench sediments and accretionary prisms, CRSQ 37(3):142—152, 2000. Return to text. Oard, M.J., Lack of evidence for subduction renders plate tectonics unlikely: Part II—Extension dominant at ‘convergent subduction zones’, CRSQ 37(4):227—234, 2001. Return to text. Reed, J.K., Bennett, C.B., Froede Jr., C.R., Oard, M.J. and Woodmorappe, J., An introduction to plate tectonics and catastrophic plate tectonics; in: Reed, J.K. (Ed. ), Plate Tectonics: A Different View, Creation Research Society Monograph 10, St Joseph, pp. 11—23, 2000. Return to text. Woodmorappe, J., Continental fits revisited as a non-evidence for continental drift; in: Reed, Ref. 4, pp. 77—92. Return to text. McPhee, J., In Suspect Terrain, Farrar, Straus and Giroux, New York, 1983. Return to text. Beloussov et al. (Eds), Critical Aspects of the Plate Tectonics Theory—Volume I (Criticisms on the Plate Tectonics Theory), Theophrastus Publications S.A., Athens, 1990. Return to text. Beloussov et al. (Eds), Critical Aspects of the Plate Tectonics Theory—Volume II (Alternative Theories), Theophrastus Publications S.A., Athens, 1990. Return to text. Chatterjee, S. and Hotton III, N. (Eds), New Concepts in Global Tectonics, Texas Tech University Press, Lubbock, 1992. Return to text. Oard, M.J., Literature criticisms of plate tectonics; in: Reed, Ref. 4, pp. 25—64. Return to text. Nitecki, M.H., Lemke, J.L., Pullman, H.W. and Johnson, M.E., Acceptance of plate tectonic theory by geologists, Geology 6:661—664, p. 662, 1978. Return to text. Glen, W., How science works in the mass-extinction debates; in: Glen W. (Ed. ), The Mass-Extinction Debates: How Science Works in a Crises, Stanford University Press, Stanford, pp. 39—91, 1994; p. 75. Return to text. LeGrand, H.E., Drifting Continents and Shifting Theories, Cambridge University Press, New York, p. 216, 1988. Return to text. McPhee, Ref. 6, pp. 120, 121. Return to text. McPhee, Ref. 6, p. 209. Return to text. McPhee, Ref. 6, p. 130. Return to text. McPhee, Ref. 6, p. 140. Return to text. Oard, M.J., Subduction unlikely—Plate tectonics improbable; in: Reed, Ref. 4, pp. 93–145. Return to text. McCarthy, J. and Scholl, D.W., Mechanisms of subduction accretion along the central Aleutian Trench, Geological Society of America Bulletin 96:691—701, 1985; p. 691. Return to text. McNeill, L.C., Piper, K.A., Goldfinger, C., Kulm, L.D. and Yeats, R.S., Listric normal faulting on the Cascadia continental margin, J. Geophysical Research 102(B6):12123—12138, 1997; p. 12123. Return to text. von Huene, R., To accrete or not accrete, that is the question, Geologische Rundschau 75(1):1—15, 1986; p. 3. Return to text. Oard, Ref. 10, pp. 44—45. Return to text. Kerr, R.A., Earth’s surface may move itself, Science 269:1214—1215, 1995. Return to text. VanDecar, J.C., James, D.E. and Assumpςao, M., Seismic evidence for a fossil mantle plume beneath South America and implications for plate driving forces, Nature 378:25—31, 1995; p. 25. Return to text. Snelling, A.A., Plate tectonics: have the continents really moved apart? Journal of Creation 9(1):12—20, 1995, p. 13. Return to text. Hast, N., The state of stress in the upper part of the Earth’s crust, Tectonophysics 8:169—211, 1969. Return to text. Anfiloff, V., The tectonic framework of Australia; in: Chatterjee and Hotton III (Eds), Ref. 9, pp. 75—109; p. 90. Return to text. Snelling, Ref. 25, p. 15. Return to text. Vardiman, L., Snelling, A.A. and Chaffin, E.F. (Eds), Radioisotopes and the Age of the Earth: A Young-Earth Creationist Research Initiative, Institute for Creation Research and Creation Research Society, El Cajon and St Joseph, 2000. Return to text. Oard, Ref. 10, pp. 29—35. Return to text. Woodmorappe, Ref. 5, pp. 82—83. Return to text. Oard, M.J., Ancient Ice Ages or Gigantic Submarine Landslides? Creation Research Society Monograph 6, St. Joseph, pp. 11—13, 1997. Return to text. Oard, Ref. 10, pp. 35—38. Return to text. Hill, M.L., Transform faults; in: Kahle, C.F. (Ed. ), Plate Tectonics—Assessments and Reassessments, American Association of Petroleum Geologists Memoir 23, Tulsa, pp. 240—243, 1974. Return to text. Oldenburg, D.W. and Brune, J.N., Ridge transform fault spreading pattern in freezing wax, Science 178:301—304, 1972. Return to text. Ghosh, S.K., An experimental study of ridge offsets in relation to trends of ridge and transform faults, using wax models; in: Chatterjee and Hotton III (Eds), Ref. 9, pp. 23—32. Return to text. LeGrand, Ref. 13, p. 56. Return to text. Oard, Ref. 10, pp. 38—41. Return to text. McPhee, Ref. 6, p. 127. Return to text. Oard, Ref. 10, pp. 45—46. Return to text. Stevenson, A.J., Scholl, D.W. and Vallier, T.L., Tectonic and geologic implications of the Zodiac fan, Aleutian abyssal plain, northeast pacific, Geological Society of America Bulletin 94:259—273, 1983. Return to text. Froede, Jr., C.R., The expanding African plate: a problem within plate tectonics and catastrophic plate tectonics; in: Reed, Ref. 4, pp. 65—76. Return to text. Froede, Jr., C.R., Questions regarding the Wilson cycle in plate tectonics and catastrophic plate tectonics; in: Reed, Ref. 4, pp. 147—160. Return to text. Austin et al., Ref. 1, p. 615. Return to text. Holt, R.D., Evidence for a Late Cainozoic Flood/post-Flood boundary, Journal of Creation 10(1):128—167, 1996. Return to text. Oard, M.J., Where is the Flood/post-Flood boundary in the rock record? 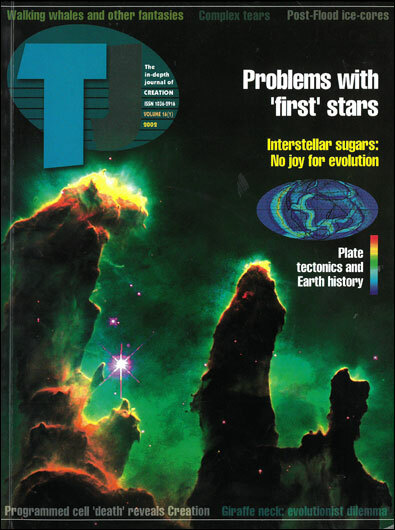 Journal of Creation 10(2):258—278, 1996. Return to text. Oard, M.J., Dinosaurs in the Flood: a response, CEN Tech. J. 12(1):69—86, 1998. Return to text. Morris, H.M., The geological column and the Flood of Genesis, CRSQ 33:49—57, 1996. Return to text. Woodmorappe, J., Studies in Flood geology: clarifications related to the ‘reality’ of the geological column, CEN Tech. J. 10(2):279—290, 1996. Return to text. Froede, Jr., C.R. and Reed, J.K., Assessing creationist stratigraphy with evidence from the Gulf of Mexico, CRSQ 36:51—60, 1999. Return to text. Walker, T., A Biblical geologic model; in: Walsh, R.E. (Ed. ), Proceedings of the Third International Conference on Creationism, Technical Symposium Sessions, Creation Science Fellowship, Pittsburgh, pp. 581—592, 1994. Return to text.